If you notice that my symptoms don’t quite line up with your timeline, don’t worry! Apparently, twin pregnancies track about 6 weeks ahead of singleton pregnancies with respect to symptoms and measurements. At least that’s what my doctor says! While a 25-35lb weight gain is recommended for a singleton pregnancy (assuming a healthy pre-pregnancy weight), my doctor has recommended a 40-50lb weight gain for my diamniotic dichorionic twin pregnancy. Those fancy words translate to ‘my babies need a lesson on sharing as soon as they exit the womb’. Not all twins have their own amniotic sac or their own placenta, but my uterus is hauling two of each! Bring on the weight! I’ll try to do an update every week or so, but we’ll just play it by ear and see how I’m feeling! How far along? 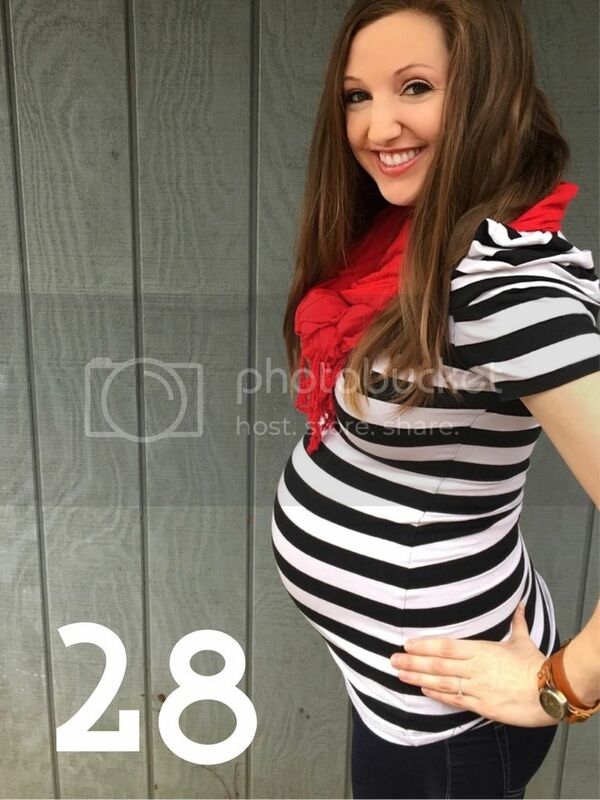 28 Weeks… a little past it actually. Sleep? I can fall asleep easier than it has been in the past when my insomnia was really bad, but I have to wake up to pee a lot more now since the babies are getting so big and squishing my bladder! Best moment this week? Having lunch with a couple of different church friends that I hadn’t seen in a while. Movement? All the time still, just bigger kicks as we get bigger babies. Food Cravings? All things sweet! But like the rest of my ‘cravings’, that’s not pregnancy-related…. that’s just Cara. Anything making you queasy or sick? Being awake…. but seriously. Symptoms? Nausea/vomiting, backaches, itching, nosebleeds, swelling. Stretch Marks? None so far! Looking forward to? Holding my babies! To stay up to date on all my posts about the twins, check out my link on the sidebar (to the right)! You can also subscribe and have each of our posts delivered straight to your inbox – it’s free!